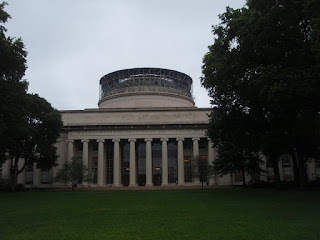 While visiting the east coast, hubby and I took a walk around MIT and the surrounding area. It's been 10+ years since we both graduated and we had never been back with the kids. We only really had about 6 hours or so to sightsee before having to get back to the hotel, sleep and get on our 6am flight back home. I didn't want to try to do too much with the kids in tow; so we decided to eat at a couple of our favorite restaurants for lunch and dinner, visit the MIT Museum (which we'd never been to before) and walk around campus to see what had changed and what hadn't. We had reservations at the hotel at University Park, which is right up Mass Ave from MIT. It used to be called the Hotel at MIT, but someone else bought it and changed its name to something french. First stop: Bertucci's for some Italian food. The kids had cheese pizza, of course, and I really wanted some of that Linguine and Clams that I used to have. But alas they no longer served linguine and clams; I settled for Rigatoni Abruzzi, which was good. The kids meal ended with ice cream, so they were happy. Second Stop: MIT Museum. This was something we never got around to doing while living in Cambridge. I guess we felt like we'd lived MIT, so why go see the museum. When we walked in I noticed that anyone with a student ID got in free. I said something to hubby like "too bad we don't have our ID anymore", and the man behind the desk asked me which school. I told him that hubby and I were students at MIT a long time ago and showed him my Brass Rat (school ring). He said "You're all set. Go on in." Cool! My Brass Rat got me Free admission! The Museum was nice. It had some MIT History stuff, a large exhibit on robotics, 2 rooms of Holographic images (son loved this one), an interactive exhibit on DNA, and a couple of rooms with these neat mechanical sculptures (my favorite). I was hoping to see a larger exhibit on Hacking, but that was really confined to a small piece of a wall. Another interesting thing was the small bit about Athena (MIT computer labs). It said that 1991 was the first year that Athena became a permanent fixture that everyone used. That's the year hubby arrived at MIT! I thought Athena had been around a lot longer than that, but I guess his class were really guinea pigs in a way. Very interesting! Third stop: MIT Campus. From the Museum, we walked down Mass Ave to campus and entered at Lobby 7. It was somewhat surreal taking the kids into a place that I'd only been when I wasn't Mommy. I pointed out some of the things about the building I thought the kids might find interesting. I told son that the long hallway that runs down the center is called the Infinite Corridor because it seems like it goes on forever without ending. Son: "Why does it never end? Will we be able to get out?" We walked past the place that used to house the Fishbowl computer cluster, but that was gone now. We walked past the bursar's office where there used to be a mural of a dollar bill covering the whole wall, but the mural was gone as well. We were beginning to feel that all of the fun things we remembered were gone when we climbed the stairs to 10-250 and found one of the lecture halls I did a lot of sleeping in. :) We opened the doors and went inside to find it looking almost exactly as it did when we were there. The kids sat in the seats and I got a picture of them looking very collegiate. It was pouring rain, so we didn't venture out into Killian court at this point, but told the kids about some of the sculptures in the field that we used to climb on and explained that we sat in that field on graduation day. We then went up a couple of floors hoping to find the Doc Edgerton strobe lab. Yay! It was still there. So we played with the exhibits on the wall a bit and looked at the neat and famous photos by Doc (apple photo, Milk drop photo). 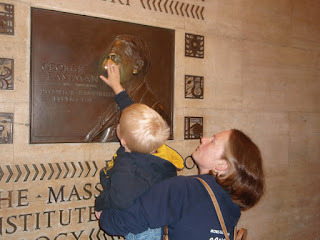 Next we took some pictures of the kids next to other notable artwork on campus like the jungle mural in building 2 and then had them rub George Eastman's nose in lobby 6. We walked out into Killian when the rain let up a bit and took some pictures of the kids in front of the big dome. There was apparently some work being done on the dome as it was covered in scaffolding. 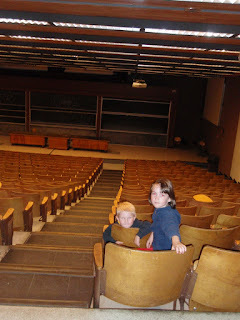 Then we ventured to the next lecture hall we spent a lot of time in: 26-100, then headed to East Campus, where we lived. The dorm looked just the same as we remembered it from the outside. I know the inside most likely looked a lot different from when we lived there, but I can live in my own fantasy world and assume it looks exactly the same on the inside, too. :) After that, we headed to the Coop, bought a few T-shirts and left campus. Fourth stop: the T. I knew the kids would enjoy the subway (T) so we decided to take the T from the Kendall stop to Central Square back to close to where our hotel was. I showed daughter the neat chimes that are installed between the tracks. You swing this bar on the side of the platform and it swings these hammers into chimes over the tracks to make some music. She thought it was pretty cool. We got on the T at rush hour, so we were packed into the cars like sardines, but the kids didn't seem to mind. We then got off at Central and walked back to University Park to have dinner. Fifth stop: Royal East Restaurant and Tosci's. The only thing I really wanted for dinner was Suan La Chow Shau, which you can apparently only get in the Boston area as I've never found it anywhere else. 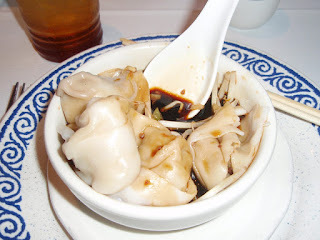 It's like Wonton Soup, but has a soy-like broth instead of clear, and it's usually quite spicy. So we ordered soup and appetizers for dinner and ate until we were stuffed. Even the kids ate well! I was stuffed, but the kids still had room for ice cream. So we went down the street to Tosci's where the kids had some ice cream, and I stole a couple of bites. I guess when you've been away for a while you forget some things like how the entire area in University park smells like chocolate because of the Tootsie Roll factory there. The kids really wanted to go in, but there didn't seem to be a visitor's door, so we just walked by and smelled. I do remember getting really sick of that smell when I lived there, but after being away, it was sort of nice. 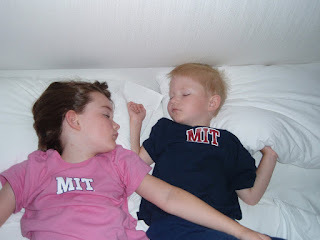 I'm not sure if I had a favorite part of the little jaunt into our old MIT life; I liked it all. But when asked what their favorite parts were, the kids said "getting the toys at the museum gift shop and going through the revolving doors". I guess when you're a kid the littlest things are the most fun.